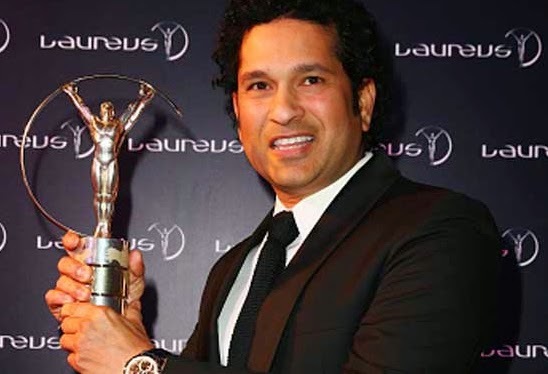 --> Indian cricket icon Sachin Tendulkar was inducted as one of the five new members into the prestigious Laureus Sports Academy in a glittering annual award ceremony at the Shanghai Grand theatre on 15 April 2015. --> Besides Tendulkar, retired Chinese professional basketball player Yao Ming, Kenyan long-distance runner Tegla Loroupe, Chinese gymnast Li Xiaopeng and former Chinese short track speed skater Yang Yang were the other athletes to be inducted into the Laureus academy. --> Last year, Rahul Dravid was selected as a member of the academy. --> Laureus World sports Academy is the jury which decides upon the winners for all categories at World Sports awards given out every year. --> Novak Djokovic has been named the Laureus World Sportsman of the Year at a ceremony on 15 April 2015 in Shanghai, China. --> Genzebe Dibaba (Ethiopia) - Athletics won the world sportswoman of the year. --> Germany (men's) football team was named world team of the year. --> A high-level committee formed by the Union government to look into the provisions of the Official Secrets Act in the light of the Right to Information (RTI) Act will meet for the first time in North Block on 16 April 2015. --> The committee, comprising Home Secretary L.C. Goyal, Law Secretary P.K. Malhotra and Secretary, Department of Personnel and Training, Sanjay Kothari, was constituted in February, but notified only recently. --> The inter-ministerial committee will be headed by Cabinet Secretary Ajit Seth. --> Six political parties viz. Janata Dal (United), Rashtriya Janata Dal (RJD), Samajwadi Party (SP), Janata Dal (Secular), Indian National Lok Dal (INLD) and Samajwadi Janata Party (SJP) on 15 April 2015 announced the formation of a new party by merging themselves. --> Samajwadi Party leader Mulayam Singh will head the party and the parliamentary board, but the name, flag, symbol, policy and party programme will be finalised by a six-member committee later. --> Telecom equipment major Nokia will acquire which French telecommunications Alcatel-Lucent for around $16.6 billion. --> Nokia will give Alcatel-Lucent shareholders 0.55 shares in the combined company for each of their old shares, resulting in 33.5% of the entity being in Alcatel's hands and Nokia having 66.5% if the public exchange offer is fully taken up. --> Senior diplomat Mohan Kumar, currently India's top envoy to Bahrain, has been appointed the next Ambassador to France to succeed Arun Kumar. --> A 1981-batch IFS officer, Mohan Kumar is expected to take up his assignment shortly, External Affairs Ministry said. --> The official announcement for Mohan Kumar's appointment comes six days after Prime Minister Narendra Modi's visit to France. --> Arun Kumar has been appointed the country's Ambassador to the US, replacing S Jaishankar. --> State-owned power equipment maker BHEL has signed a Memorandum of Understanding (MoU) with a Russian company INTMA, to set up a gas-based power project in Kazakhstan. --> The MoU will further help BHEL in consolidating its presence in the CIS countries, the company said. --> BHEL is currently executing 23 major projects in 16 countries and has a presence in more than 75 countries. --> INTMA is one of the leading general Engineering Procurement and Construction contractors (EPC) in Russia and Kazakhstan. --> Justice Meenakshi Madan Rai was sworn in as the first lady judge of the Sikkim High Court. --> Governor of Sikkim Srinivas Patil administered the oath of office to her at Raj Bhavan in Gangtok. --> Renowned Assamese filmmaker and actor Bidyut Chakraborty died on 15 April 2015. --> He directed several Assamese movies including Raag-Biraag, Goon Goon Gaane Gaane, Dwaar. --> Chakraborty even won Indira Gandhi national award for Raag Biraag.